THE GARDEN OF EDEN COMES TO BROADWAY! This charming revival opened on Broadway at Studio 54 this past December forty years after the original debuted. It is a unique production staged as three one-act musicals about men, women and temptation. 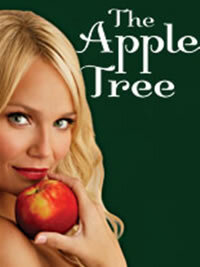 The Apple Tree is based on “The Diary of Adam and Eve” by Mark Twain, “The Lady or the Tiger?” by Frank R. Stockton and “Passionella” by Jules Feiffer. This musical comedy spotlights three tales of romantic relationships. Each has its own storyline, but all three are linked together by musical themes and references. They all deal with love and the consequences of temptation. In each vignette the characters are faced with choices that are not always easy to decide. In some cases the most tempting path seems the way to go even if it isn’t the right way. The dialogue is witty and entertaining and makes for some good laughs. The delightful score allows for each tale to flow into the next. The book, music and lyrics are by Jerry Bock and Sheldon Harnick, the same writing team that brought Fiddler on the Roof and She Loves Me to the stage. Much of the charm of the production is credited to, the lead actress, Tony Award winner Kristin Chenoweth. She plays three distinct roles in each of the stories and brings a sparkle to them all. She has a great stage presence, perfect comedic timing, and her on-stage chemistry with her two male leads, Brian d’Arcy James and Marc Kudisch, is remarkable. Chenoweth can be compared to such screwball comedians as Lucille Ball and Carol Burnett, and brings much experience to this production. In 1999 she won a Tony Award for her work in You’re a Good Man Charlie Brown and not only received a Tony nomination, but rave reviews as well for her role in Wicked as the original Glinda the Good Witch in 2003. She has also starred in several films including RV with Robin Williams and more recently in Deck the Halls opposite Matthew Broderick and Danny DeVito. The Roundabout Theatre Company which is responsible for bringing this production back to stage life is known for taking lesser known musicals from Broadways past, Chicago for example, and introducing them to a whole new generation of theatergoers. The Apple Tree first premiered in 1966 and starred Alan Alda, of “M*A*S*H” fame, and Barbara Harris who won the Tony for her role in the performance. The original show was nominated for seven Tony Awards including Best Musical and ran for 463 performances before closing in 1967. If you are looking for a light, enjoyable night at the theater then this is the show for you, but hurry because it is a limited engagement and is scheduled to close on March 11, 2007. The Apple Tree Broadway tickets are selling on average for 52.00 with the premium seat running around 112.00. Studio 54 Theater has a seating capacity of 8,048 and sells out on average about 7,000 seats per show. The Apple Tree Broadway tickets can be found using the link below. To view all available The Apple Tree Broadway Tickets click the link. Take the B, D, E trains to 53rd Street & 7th Avenue. Take the A, B, C, D, 1, 9 trains to 59th Street-Columbus Circle.